The end is near! The end of 2016, that is. This has been a year filled with ups and downs (and downs, and downs, and downs...)—but one area that was absolutely overflowing with ups was my reading life. As of writing this post, I've read 88 books since January 1. It's no match for last year's total, but still a pretty respectable sum. The best part: a lot of those books were truly amazing. So without further ado: My Top Ten Reads of 2016! This list really does encompass the entire year. ALL THE LIGHT WE CANNOT SEE was the first book I read in 2016—a strong start!—and I finished THE SUN IS ALSO A STAR in early December. 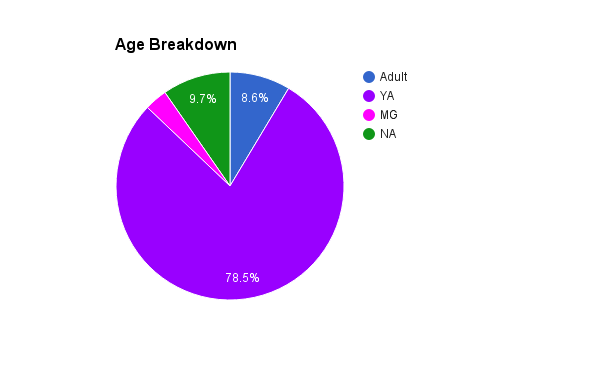 As for demographic, there are two adult books and eight YAs, which is honestly pretty representative of my reading patterns as a whole. And then there's genre: one historical, two (very different) fantasies, one magical realism, and six realistic stories, ranging from happy-ending romance to epic emotional journeys. Not bad! ALL THE LIGHT WE CANNOT SEE: A blind French girl and a German boy try to survive the devastation of World War II. Gorgeous prose, and filled with short vignettes that interconnect in surprising ways. THE SACRED LIES OF MINNOW BLY: After escaping from the cult that took her childhood and her hands, seventeen-year-old Minnow is in juvenile detention, debating whether to open up to a detective about the circumstances that put her behind bars. UP TO THIS POINTE: An unexpected letdown sends ballet dancer Harper fleeing to Antarctica's McMurdo Station, where she comes to terms with her past and begins embracing her future during a cold, dark winter. THE SERPENT KING: Three outcasts in rural Tennessee—the son of a disgraced snake-handling preacher, an ambitious teen fashion blogger, and an epic fantasy nerd—face senior year together. Warning: this one's a tear-jerker. CHALLENGER DEEP: A before-and-after-and-during story about a high-schooler's descent into mental illness, where nothing is really as it seems. This is a compelling and harrowing portrayal of schizophrenia through the eyes of a person experiencing it in real time. ROCKS FALL, EVERYONE DIES: Aspen Quick is part of a magical family that prevents the cliff that overhangs his small town from falling. Aspen also has the ability to steal things from people: memories, emotions, scars. In one summer, he'll learn the uncomfortable truths about his family and his gift. WHEN THE MOON WAS OURS: Miel grows roses from her wrists. Sam paints moons to hang in the trees. Together, they hide secrets about their respective pasts. Over the course of this lushly written, magical book, they each make peace with who they really are—and who they love. THE SUN IS ALSO A STAR: It's Natasha's last day in the United States: she's being deported to Jamaica. It's the day that's supposed to launch Daniel's future: he's interviewing for a college program his Korean parents want more than he does. Natasha doesn't believe in love. Daniel's a romantic and a poet. In one New York City day, they find and fall for each other. What were your favorite reads of 2016? Share in the comments!